The snow gives the weeds a special beauty. Although it’s warm today, we have had lots of snow recently here on our mountain ridge in the Shenandoah Valley. I especially love this photo of a copse of persimmon trees. With Christmas less than two weeks away, many of us are anxiously wondering what to give the loved ones on our list. A few years ago I was a member of a women’s group that decided to exchange gifts at Christmas. I really did not know what some of the women would like, so I took a chance. I looked online at the gifts some environmental organizations offer during the holiday season. These groups have found creative ways to ‘package’ some of their work into concrete actions that individuals can fund. A donation of a certain amount pays for a specific action or supports a particular effort. And the recipients of such ‘gifts’ get the satisfaction of participating in efforts to protect our planet. My gifts were enthusiastically received. Some recipients even said they were inspired to give such gifts to those on their own lists. The World Wildlife Fund (WWF) offers “species adoptions” that make good gifts for children. If you click here, you can select from more than 100 species. When you make a donation of $50, the recipient will receive a “panda adoption kit,” “tiger adoption kit,” “toucan adoption kit,” etc. The ‘kit’ consists of a stuffed animal of that species, an adoption certificate, a photo of the animal, and written information about the animal. While you may feel that WWF should not waste its resources paying for stuffed animals, these “adoption kits” can be tangible, fun ways to educate children, while also empowering them to help. 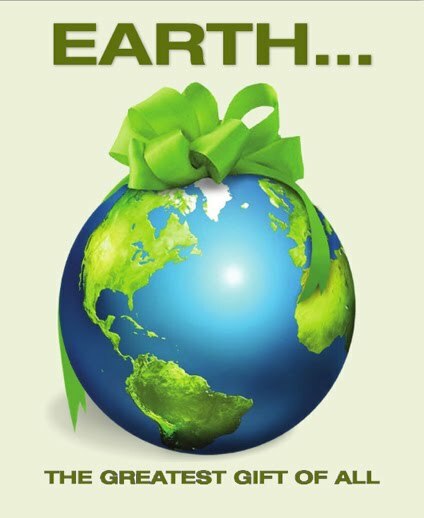 Earthjustice is another organization that offers gifts that are also good for the planet. Since 1971, Earthjustice (formerly the Sierra Club Legal Defense Fund) has been providing free legal help to community organizations fighting for protection of habitat and clean air and water. Because the earth needs a good lawyer. Earthjustice’s Earth Gifts range from $35-$200. A $35 donation in your loved one’s name will support efforts to keep wilderness areas roadless or defend the Clean Air Act and its many successes. For $75, your loved one will have the satisfaction of supporting efforts to keep our streams and rivers clean or protect whales from sonar testing and overfishing. And there are many other available gifts. Just click here. Your loved one will receive an ecard describing the gift you give in his or her name. Perhaps my personal favorite gifts are from the Natural Resources Defense Council (NRDC); they are very specific and inexpensive. For example, a $15 gift funds the planting of a tree in a Costa Rican rainforest. A $25 gift will ensure the planting of a dozen milkweed plants–the plant monarch butterflies most need to survive. A $25 gift could be directed to ocean protection, and a gift of $35 will support efforts to defend polar bears’ habitat from oil drilling. Recipients of NRDC gifts receive a card, by mail or email as you choose. To learn more, click here. One of the best things about spending time in the forest down below our house is noticing things I’ve never noticed before. A few days ago I was admiring some turkey-tail-type fungus growing out from the base of a dead tree. I always enjoy these fungi, with their fan-shape and colorful stripes that repeat the curved edge of the fungus. I am astonished at how many shapes and colors of these fungi I have seen. I’m sure there are many more. As I bent to admire the turkey-tails protruding from the tree trunk, I noticed something else. Thin, twiglike suckers were also growing from the base of the dead tree. Normally, I don’t even notice these scraggly stems shooting upward. But these had been colonized by the same fungus that was protruding from the tree’s base, just inches away! You are currently browsing the Earth Connection blog archives for December, 2013.